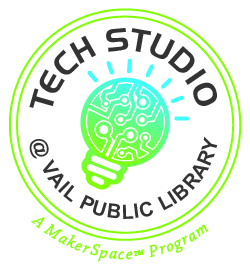 Join us in Tech Studio, Vail Public Library’s very own MakerSpace! Located on the lower level of the library (across from the elevator), our Tech Studio is a true creation station for all ages, abilities, and interests. Explore, create, collaborate, and invent in a safe and supportive environment! Vail Public Library offers not one, but TWO Robotics classes each season. In Robotics I, we build, program, and complete challenges using Lego Mindstorm EV3s. In Robotics II we build on existing knowledge to create more elaborate codes and really bring our EV3s to life! Space is always limited and we do ask participants to make a commitment to attending each week since the weeks build on each other. Please RSVP to Cricket Pylman or contact her with any questions you may have about Robotics Club! Need a little One-on-One Tech Support? Not sure how to access that new program? Wondering what else you can do with your device? Book an appointment to get one-on-one tech help with a qualified library volunteer! Please visit the Service Desk or call 970-479-2187 for assistance. PLEASE NOTE- We do not troubleshoot or fix broken devices, and we will not replace parts on your device. If you’re anxiously waiting for the premiere of Ready Player One (or you’ve read the book by Ernest Cline), then you already know what to expect when you put on the Oculus Rift headset. And if this is the first time you’ve heard about VR…well, you’re in for an adventure! Imagine swimming with sharks, walking through an art galleryon the other side of the globe, or stepping off that globe altogether to examine the stars. Imagine flying above distant cities like Superman, or meeting a dinosaur moments before the meteor strikes, or actually sitting at the table while the characters of Disney’s Beauty and the Beast sing and dance around you. All of this, and more, is waiting for you inside the Rift. Vail Public Library Tech Studio is proud to offer our patrons the use of two Lulzbot Mini 3D printers. Made in Loveland Colorado, the Lulzbot mini is a favorite of 3D Hubs, Make: Magazine, and almost every patron who gives them a try! In fact, as an advocate for open sourcing, the company behind these printers has made all of the software source-code, plans, and material lists for these printers available online, for free. So if you enjoy tinkering, this is the printer for you! Print Materials: PLAyPHAb™ meets ASTM D6400 standards for biodegradability and maintains a dimensional accuracy better than +/- 0.03mm. PLAyPHAb™ has greater UV and impact resistance than PLA, increased flexibility, excellent layer adhesion, produces a glossy finish, and once opened has a tremendous increase in shelf life compared to PLA. Slicing Software: Cura LulzBot Edition is a Free Software program that both prepares your files for printing (by converting your model into GCODE), and also allows you to control the operation of your LulzBot 3D printer. And for those who just want to play… you can select something from the Thingiverse collection of “ready to print” objects or build your own STL file using a fun and friendly (free) program like TinkerCad, BlocksCAD, or SketchUp. We encourage original designs and would love to help you create something wonderful! During Tech Studio hours we do limit print job length to 30 minutes or less and these small prints are done for free. For longer prints, please call to discuss hours and costs as we do charge 5 cents/gram for the filament used in larger prints. Created in the Denver area, Sphero is an app-controlled ball that does it all. Controlled by a smartphone or tablet, Sphero can change colors, complete challenges, learn tricks, dance, and more. There are no rules, and no instructions… Sphero teaches coding and robotics through play and creative engagement with the user.